EcoFloridian provides quality tree & shrub care services in Hernando, Citrus, & the surrounding counties in FL. Like any proud homeowner, you probably dedicate significant amounts of time to maintaining the appearance of your yard. For most people, this mostly means cutting the grass regularly and occasionally pruning trees and shrubs. While most folks fertilize their lawns, few bother to do the same for their trees, shrubs and other plants. With tree and shrub care services by EcoFloridian® Lawn and Pest Control, you can keep your yard looking fantastic without lifting a finger. 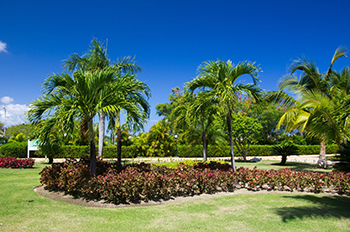 Our shrub and tree care specialists will inspect and treat all ornamental plants, palms and trees on your property to ensure their ongoing health and appearance. At EcoFloridian® Lawn and Pest Control, we know how easy it is to overlook the trees, shrubs, palms and ornamental plants in your yard. However, failing to care for them can slowly but surely degrade the appearance and health of your landscaping. Over time, it can even reduce the value of your property. Fungi, insects, diseases and other issues are all threats. Without regular interventions, they can wreak havoc on even the most beautiful landscaping work. Don't let it happen to you. With all-inclusive shrubbery care from EcoFloridian® Lawn and Pest Control, you can rest easy in the knowledge that every last inch of your yard is being cared for by capable hands. Fungus Control - Certain plants are susceptible to fungus. We'll treat them to keep any from developing. If an inspection reveals fungus on a plant, our technicians will take steps to resolve the issue as quickly and effectively as possible. Insect Control - Nothing is more frustrating than watching a gorgeous plant wither away due to insect activity. Fortunately, EcoFloridian® Lawn and Pest Control knows what to do. Our shrubbery care experts will use specialized tools, equipment and techniques to prevent common pests from ruining your plants. Disease Control - Like animals, plants get sick from time to time. Certain diseases target certain plants, and they can quickly decimate them. Since we come out every other month, we can nip diseases in the bud before they cause permanent damage. We will also take steps to keep diseases from developing on your plants in the first place. Under our care, your plants and shrubs will keep flourishing from one season to the next. Don't leave the health and appearance of the shrubs and trees in your yard to chance. By the time problems are plainly visible, they're often difficult to overcome. By opting for all-inclusive shrubbery care services by EcoFloridian® Lawn and Pest Control, you will actively maintain the value and appearance of your yard and home. We're ready when you are, so give us a call today.